Optimization of the history of the deals functions to speed up the work of the copyist to reduce the load on computer resources. Added execution of the algorithm on the tick, if the timer has not been initialized. - When copying from MT4 to MT5 and partially closing the position on MT4, the copied position on MT5 will be closed completely !!! This eliminates the mistake of improperly copying a partially closed position! Partial closure on the MT5 terminal and COPYLOT is not supported! - LotExp - Lot coefficient from the master. 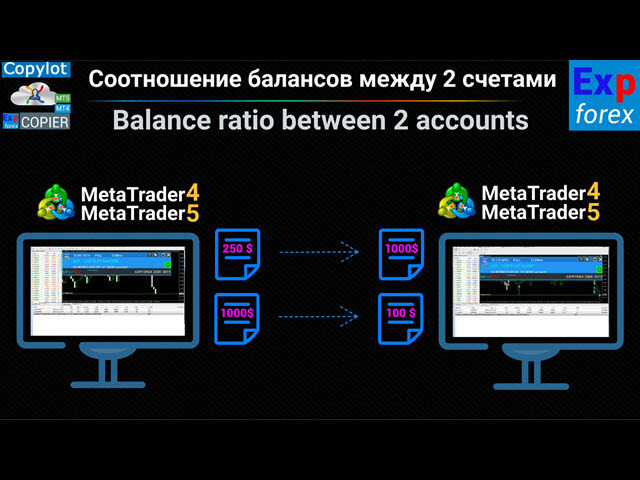 You can set to increase or decrease the risk with the master account. Modified the algorithm for automatically determining the orders filling type. The copier has been modified for working on hedge accounts. Fixed the error of handling the symbols with the suffix "..."
Added the auto-detection of the symbol suffix, if it differs from the standard name of the currency pair. If the currency name on the client terminal has a suffix, i.e. EURUSD.m, then the trades will be copied with the suffix ".m"
- Fixed the error of modification of stop levels when using TP_adjust and SL_adjust. - If it is impossible to open a deal according to the master account, DISABLED_TRADE will be displayed in the comment field - trade is prohibited for the symbol. - Added automatic detection of the order filling type. Fixed opening positions for the derivatives market, if the Deal is not complete. Added forced detection of the new client tickets for the FORTS market. Closing deals on a master account leads to their forced closing on a client account as well.